SEEDED MEN & WOMEN ONLY WILL ACCESS THE 5K START FROM THE FRONT AND SHOULD UTILIZE THE SEEDED/ELITE ENTRANCE LOCATED AT BROREIN STREET & ASHLEY DRIVE. All other 5K Wave Start #1 participants will stage on Brorein Street behind the Seeded Start Area. 5K Wave Start #1 participants should enter through the barricade breaks (marked with Green barricades signage) on the south side of Brorein that will be placed at the rear of Start Corral. Access to Wave Start Corrals will be monitored and controlled according to Projected Finish Times and Race Number colors. PLEASE, for the safety and enjoyment of all, line up in your assigned Wave/Corral. 5K Wave Start #2 participants will stage on Brorein Street. 5K Wave Start #2 participants should enter through the barricade break (marked with Blue barricade signage) at the rear of the Blue Wave Start Corral from the south side of Brorein Street. To access the Blue Wave Start Corral, please utilize Franklin Street to Brorein. Once on Brorein, proceed to the Blue Wave Start Corral. Once all of the Wave #1 registered participants have cleared the Start Area, the runners in Wave #2 will be walked to the official 5K Start Area at Brorein Street & Ashley Drive. 5K Wave Start #3 participants will stage on Brorein Street behind the Blue Wave, Wave Start #2. 5K Wave Start #3 participants should enter through the barricade break (marked with Orange barricade signage) at the rear of the Orange Wave Start Corral from the south side of Brorein Street. To access the Orange Wave Start Corral, please utilize Franklin Street to Brorein. Once on Brorein, proceed to the Orange Wave Start Corral. Once all of the Wave #2 registered participants have cleared the Start Area, the runners in Wave #3 will be walked to the official 5K Start Area at Brorein Street & Ashley Drive. 5K Wave Start #4 participants will stage on Brorein Street. 5K Wave Start #4 participants should enter from the barricade break on the south side of Brorein that will be placed at the rear of the Purple Wave Start Corral. To access the Purple Wave Start Corral, please utilize Franklin Street to Brorein. Once on Brorein, proceed north to the Purple Wave Start Corral. Once all of the Wave #3 registered participants have cleared the Start Area, the runners in Wave #4 will be walked to the official 5K Start Area at Brorein Street & Ashley Drive. To access the Red Wave Start Corral, please utilize Franklin Street to Brorein. Once on Brorein, proceed north to the Red Wave Start Corral. Once all of the Wave #4 registered participants have cleared the Start Area, the runners in Wave #2 will be walked to the official 5K Start Area at Brorein Street & Ashley Drive. Beginning at 9:45 a.m., 5K Stroller Roll Adults (5 yrs & Over) and kids In Strollers (4yrs & Under) can stage on Florida Avenue, between Brorein Street & Channelside Drive. Once Wave Start #5 registered participants have cleared the Start Area, the 5K Stroller Roll registered participants will be walked forward to the official 5K Start Line at Brorein Street & Ashley Drive. 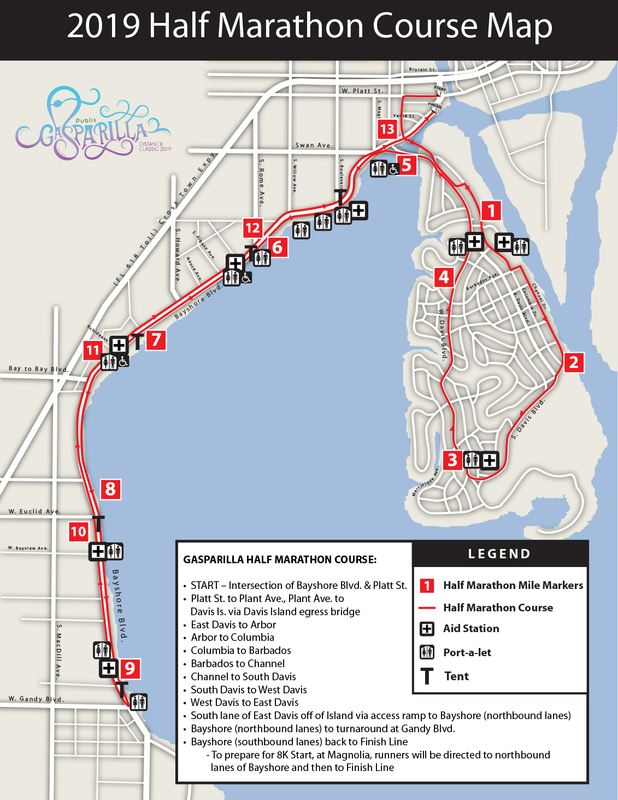 Kellogg’s 5K Stroller Roll registered participants must utilize Channelside Drive to access the rear of the 5K Stroller Roll Staging Area. For additional 5K Stroller Roll Information, please Click Here. Beginning at 9:45 a.m., 5K Walkers (Adults and Kids 5 yrs & Over) can stage on Florida Avenue, between Brorein Street & Channelside Drive and behind the Stroller Roll Staging Area. Kashi 5K Walk registered participants must utilize Franklin Street to access the rear of the 5K Walk Staging Area. Following the Start of the Kellogg’s 5K Stroller Roll at 10:00 a.m., 5K Walk registered participants will be walked to the official 5K Start Line at Brorein Street & Ashely Drive. Online registration will remain open until Sunday, February 17, 2019 (OR UNTIL 5K REACHES CAPACITY OF 14,000), but beginning Saturday, January 12, 2019, the cost of 5K registration will be according to the Late Registration Online Registration Fees ($40 – 5K). ** PLEASE NOTE THAT EVERY ADULT AND/OR CHILD MUST BE REGISTERED AND WEARING A BIB NUMBER (a dedicated Kashi 5K Walk or Kellogg’s 5K Stroller Roll Bib Number) TO PARTICIPATE IN THE KASHI 5K WALK OR KELLOGG’S 5K STROLLER ROLL. Participants that register online and provide a correct email address will receive a Race Week Registration Confirmation via email no earlier than Monday, February 18, 2019. This confirmation will be in addition to the confirmation received from imATHLETE upon completion of online registration. The Race Week Registration Confirmation will include each participant’s Race Number, Name, Address, Race Entered and Age. 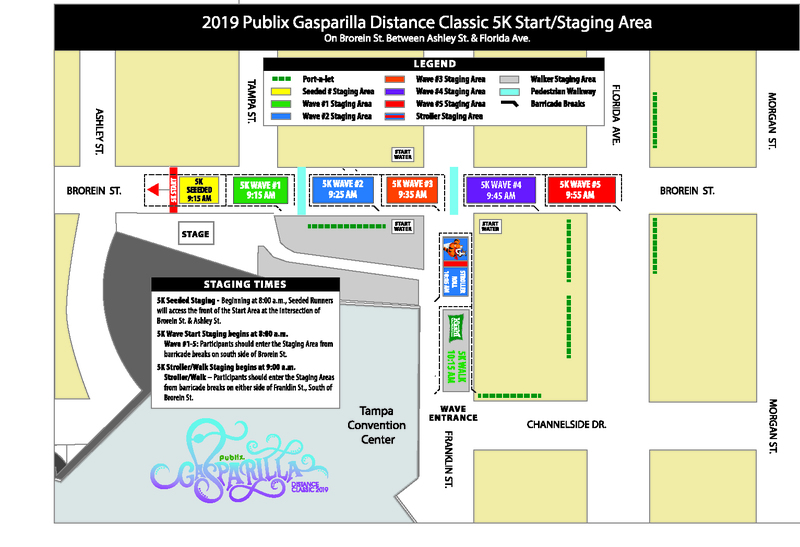 Publix Gasparilla Distance Classic 5K participants will receive an Official 2019 Publix Gasparilla Distance Classic 5K Gender Specific Performance Wicking Race Shirt**, a Virtual Race Bag, a 2019 PGDC branded Publix Reusable Shopping Bag and for those that cross the Finish Line, a 2019 Publix Gasparilla Distance Classic 5K Finisher’s Medal, Post-Race food and beverages, a complimentary 12-ounce Michelob Ultra (21-yrs & Over) and a personalized Virtual Finisher’s Certificate (a valid email address MUST be provided with registration). **Publix Gasparilla Distance Classic 5K participants that register online after January 20, 2019, or wait to register during Race Weekend Late Registration (if available) will receive a Race Shirt, but will not be guaranteed a gender-specific performance wicking shirt and/or the correct sized shirt. Publix Gasparilla Distance Classic 5K Race Packet, T-shirt, and Race Number Pick-Up will take place during the 8 On Your Side Health & Fitness Expo being held at the Tampa Convention Center – East Hall on Friday, February 22, 10 a.m. – 8 p.m., and on Saturday, February 23, beginning at 6:00 a.m. 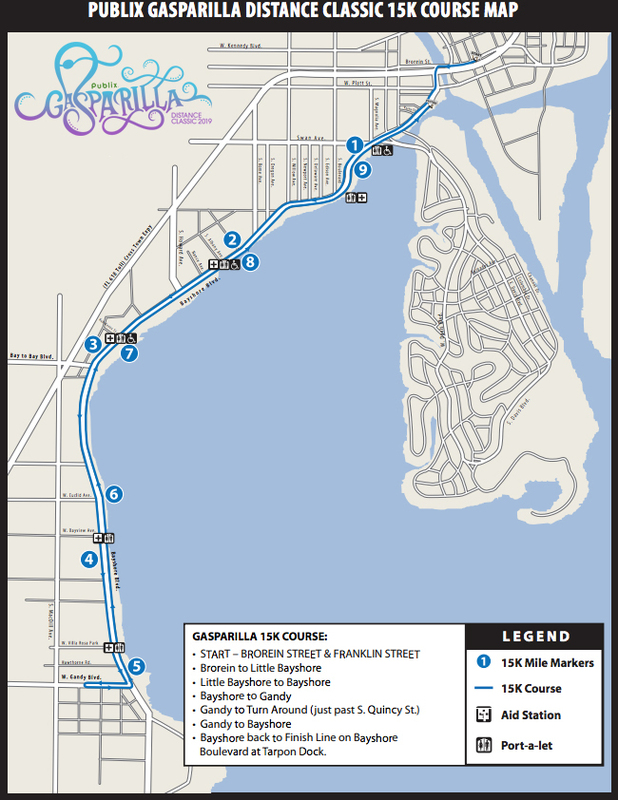 The Gasparilla Distance Classic Association is once again proud to lead the pack in offering to its runners and walkers the latest in timing technology. In 2019, race participants will once again be timed utilizing the ChronoTrack B-Tag Timing System, developed and designed with RFID – radio frequency identification. At the Finish Line, there will be no back-ups…runners and walkers will cross the Finish Line…revel in what they’ve just accomplished…be given their Finisher’s Medal and then head to the Q105 Post-Race Celebration! PLEASE NOTE – Overall Results (Top 5) will be according to the order of finish; Age Group Results will be according to Net Time. PLEASE NOTE – If you intend to run the 15K AND 5K on Saturday, February 23, 2019, you must register and complete an Entry Form for both events. Unless you are running the Michelob Ultra Challenge or Michelob Ultra Amber Challenge, you will be issued a 15K Bib Number AND a 5K Bib Number. When running the 15K, you MUST wear your assigned 15K Bib Number ONLY. Do not wear or carry your 5K Bib Number. Before starting the 5K, YOU MUST remove your 15K Bib Number and replace with your 5K Bib Number. Because of the sensitivity of the Chrono Track Timing Device, wearing or carrying your 5K Bib Number during the 15K OR wearing or carrying your 15K Bib Number during the 5K could impact your Tampa Bay Times Race Weekend Results. PLEASE NOTE – If you intend to run the 15K & 5K AND participate in the 5K Stroller Roll or 5K Walk on Saturday, February 23, 2019, you must register and complete an Entry Form for each event. When running the 15K, you MUST wear your assigned 15K Bib Number ONLY. DO NOT wear or carry your 5K Bib Number(s). Before starting the 5K Run, you must remove your 15K Bib Number and replace with your 5K Bib Number. If applicable, before starting the 5K Stroller Roll or 5K Walk, you must remove your 5K Run Bib Number and replace with your assigned 5K Stroller Roll or 5K Walk Bib Number.